Small kitchens are becoming increasingly common in condos and newer homes so it is important to make the most of what space you have. 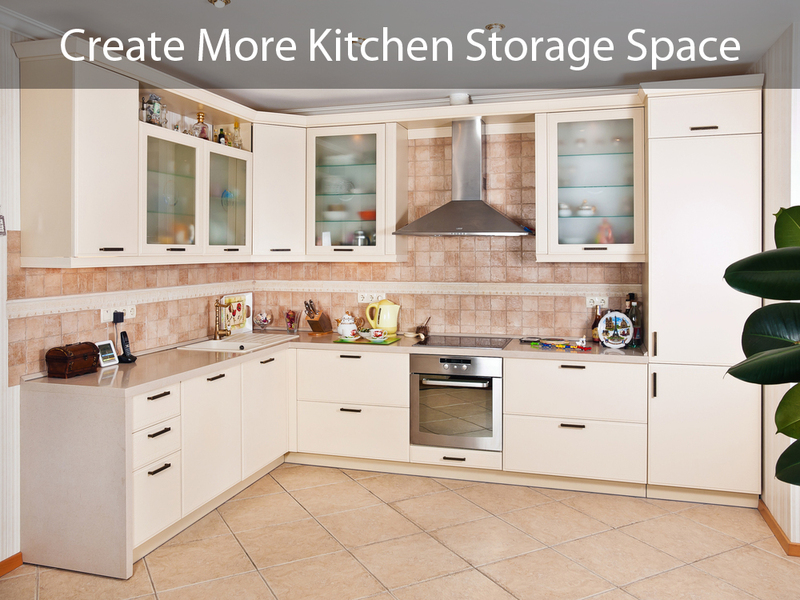 There are several ways to improve your storage situation and make your kitchen feel bigger and less cramped by making use of every little bit of space you can. Start by getting rid of everything – and I mean everything – you don’t need: now is the time to be completely ruthless. Donate extra dishes and cookware as well as any small appliance you do not use to your local Goodwill. Donate non-perishable food items that you have never touched to local homeless shelters or food banks. Keep your counters free of buildup by putting everything in its place and your kitchen will already start to feel more spacious. Shelves in cabinets or on the wall can often be spaced further apart than they need to be leaving large empty gaps of unusable space above and below each shelf. In order to maximize the storage potential of these shelves, fit each one with a hanging basket to fill the space below and purchase wire racks that will allow you room for multiple levels of dishes and glasses without dangerous, inconvenient, or unsteady stacking. Empty wall space is a missed opportunity in a small kitchen so take advantage of any convenient empty spaces to hang extra shelves, racks and hooks that will help you organize your cooking utensils and pots and pans. Save counter space by opting for a magnetic strip attached to your fridge which can hold all of your knives up and off the counter. Overhead racks for stemmed glassware can be a great way to free up some much needed space in your cabinets and they can add a nice decorative touch as well. Use drawer inserts to keep your utensils and cooking implements organized and make it easier to find what you need in those full drawers. Purchase racks for your large items like cutting boards and pot lids: by storing them vertically they will be easier to find and you will be able to fit more items into the same space. Finally, take a good look around your kitchen for any unused spaces: Many kitchens feature cabinets which do not go all the way to the ceiling and this gap can be a great place to store infrequently used items such as nice silverware. If you live alone and have a full sized fridge, you can use the empty space inside it to store items like pots and pans!